Nowadays, the number of home offices is increasing in numbers and this is because scopes and opportunities of working from home is increasing. People who work from their home want to design a part or corner of their home into their own office. Well, if it is well decorated and organized then working becomes a lot more fun. So, here are some of the brilliant ideas which you can try to make your home workspace looks great. Idea #1: If there is a spare corner at your home, which is of no use and is left unused, then you can use that. With a table with some cabinets and shelves in it can remarkably occupy the space. Arrange lights over there for better working environment. It will be compact yet it will have a lot of visual aspects. Idea #2: In case if your bedroom is a bit small in size then you can use the space beside closet or wardrobe. As simple as a shelf with just the essential things on it like lamp, laptop and essential files can make a small and compact workspace. For better inspiration, you can stick some inspiration quotes in from of your eyes in a bulletin board. Idea #3: You can also use the little space underneath your stairs. 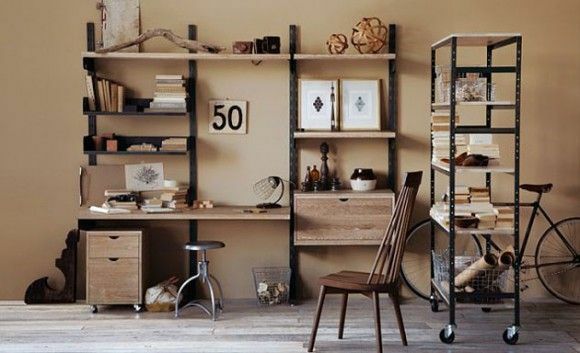 With properly arranged shelves and a desk, you can turn that little useless place into your workplace. However, make sure that you are putting enough lights if the place is dark. A dark and shabby place can never inspire you to work. Idea #4: A minimalist office idea is great if there is not much space in your house. You can simply place a table and a comfortable working chair on it. Arrange a board to pin up your important tasks, meetings etc. and a lamp. It can be in your bedroom or even in a cozy place just beside the fireplace. Idea #5: A folding work place is also a great idea to save space when you are not working. Many shelves are there in the market, which comes with folding table. When you need it open it, use that, and when you are not working fold it. Idea #6: Modern offices are quite common but if you may want a vintage or classical look for your office. Then it is best to go for white or any pastel colors as the theme of your office. A vintage desk and chair with a lamp can create that ambience. Idea #7: A workspace in front of the windows or balcony can be a great idea. The natural light coming in from the windows work great in work. So, you can definitely create a small workspace desk over there and enjoy your work. Idea #8: Often the study table just beside your bed can be turned into a beautiful workspace. With the floating shelves you can also save space on your desk. Keep all the essential things over there and just keep the lamp and laptop/PC on your desk. Idea #9: Especially for the girls, you can create a bit of girlie environment with the touch of pink or other pop colors. Create minimalist workspace with good design. A bulletin board full of beautiful and inspiring pictures and quotes, a flower vase, cute string lights etc can make the desk look great. Idea #10: If you are working with another partner then an “L” shaped desk will look good. Make sure the window is nearby for enough lights to come in and also make sure to keep a board to pin up all important things. Idea #11: You can create custom made shelves in a nook of your house which is not of any use. Make sure it is beautifully decorated and full of lights so that you do not feel working in an awkward place.